The USA Gear TabGRAB can be set up within seconds! Adjustable hooks slide to fit virtually any headrest neck, making it the perfect car accessory. Once you fit the TabGRAB to your headrest, screw-tight hooks ensure a safe connection, so you can feel confident that your eReader is safely attached. The TabGRAB features innovative "grab" wings with rubberized grips to grab on to your eReader. The wings easily adjust by sliding into a slot that corresponds to the width of your eReader for a perfect fit with a variety of devices. The durable grab wing slot mounting system locks onto your device, ensuring that is doesn't become loose while in transit. With the TabGRAB, you can achieve the optimum viewing angle every time. An articulating neck allows you to adjust the angle of your eReader for the most comfortable viewing experience. The neck features a stabilizer that folds down, giving you extra support and reduced vibration. 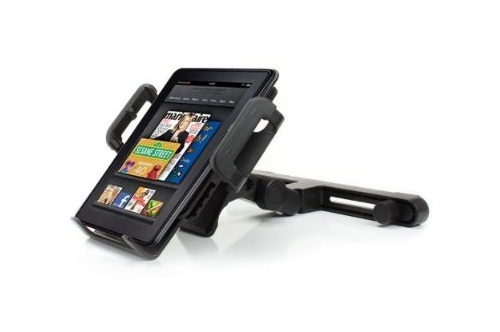 With the TabGRAB, you can display and enjoy your eReader in the car - hands free! Entertain passengers on long trips or on everyday errands. Adjust the angle to for the perfect reading angle!